Twin suicide car blasts ripped through an upscale Damascus district today, targeting heavily guarded intelligence buildings and killing at least 40 persons, Syrian authorities said. Responding to Prime Minister Yousuf Raza Gilani’s explosive statement about a conspiracy to topple the democratic government, the army chief and the Supreme Court have categorically ruled out any military takeover. The US-Pak standoff over the killing of 24 Pakistani soldiers by NATO refuses to die down with the Pakistan army today rejecting a US-led probe into the cross-border air raid and Washington refusing to apologise. 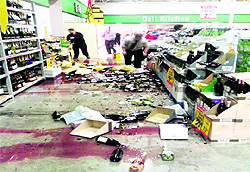 A series of strong earthquakes struck the New Zealand city of Christchurch today, rattling buildings, sending goods tumbling from shelves and prompting terrified holiday shoppers to flee into the streets. There was no tsunami alert issued and the city appeared to have been spared major damage. Myanmar’s democracy champion Aung San Suu Kyi registered her opposition party and visited the national Parliament for the first time today, as she prepares to enter the mainstream political arena. The blasts came a day after an advance team of Arab League observers arrived in the country to monitor Syria's promise to end its crackdown on protesters demanding the ouster of President Bashar Assad. Government officials took the observers to the scene of the explosions and said it backed their longtime claims that the turmoil is not a popular uprising but the work of terrorists. The blasts were the first such suicide bombing in Syria since the uprising began in March. "We said it from the beginning, this is terrorism. They are killing the army and civilians," Deputy Foreign Minister Faysal Mekdad told reporters outside the headquarters of the General Intelligence Agency, where bodies still littered the ground. State TV said initial investigations indicated possible involvement by the al-Qaida terror network. Alongside him, the head of the observer advance team Sameer Seif el-Yazal said, "We are here to see the facts on the ground... What we are seeing today is regretful, the important thing is for things to calm down." An opposition leader raised doubts over the authorities' version of the events, suggesting the regime was trying to make its case to the observers. Omar Idilbi, a member of the Syrian National Council, an umbrella group of regime opponents, called the explosions "very mysterious because they happened in heavily guarded areas that are difficult to be penetrated by a car." "The presence of the Arab League advance team of observers pushed the regime to give this story in order to scare the committee from moving around Syria," he said, though he stopped short of accusing the regime in the blasts. The blasts went off outside the main headquarters of the General Intelligence Agency and a branch of the military intelligence, two of the most powerful of Syria's multiple intelligence bodies. Addressing troops at a border post, Chief of Army Staff, Gen Ashfaq Parvez Kayani, reaffirmed commitment to support democracy and ruled out a military takeover in the country. “The rumours about a coup are misleading,” an army press release quoted General Kayani as saying. However, in remarks that indicated underlying frictions continue, Kayani said these speculations are being used as a bogey to divert the focus from the real issues. He said the Pakistan army was fully aware of its constitutional obligations and responsibilities and would continue to support the democratic process in the country. In the Supreme Court, Chief Justice Iftikhar Chaudhry reacted sharply to a reference that Gilani has voiced apprehension of a plot to oust the democratic government. “In this country, there is no question of (military) takeover because the people trust the apex court now,” said Iftikhar Muhammad Chaudhry, while hearing petitions calling for an investigation into the memo scandal. In a related development, the Presidency welcomed General Kayani’s statement indicating it was prepared to defuse tension that heightened in the aftermath of Gilani’s blunt criticism of the army. President Zardari was presiding over the core committee of his Pakistan People’s Party to discuss the evolving situation. He rejected speculations that he would be leaving the country soon. “The Pakistan Army does not agree with the findings of the US/NATO inquiry as is being reported in the media. The inquiry report is short on facts,” Pakistan’s chief military spokesman Maj Gen Athar Abbas said in Islamabad, while reacting to the US-led probe into the November 26 incident. A detailed response will be given as and when the formal report is received,” he said in a statement in Islamabad. One person was injured at a city mall and was taken to a hospital, and four persons had to be rescued after being trapped by a rock fall, the Christchurch police said in a statement. But there were no immediate reports of serious injuries or widespread damage in the city, which is still recovering from a devastating February earthquake that killed 182 persons and destroyed much of the downtown area. The visit in the capital Naypyidaw included a meeting with lower house speaker Shwe Mann, number three in the previous ruling junta and still one of the most powerful men in Myanmar, who said he was “glad” to hold the talks. “We have to work together as unity is strength,” he told reporters. Suu Kyi, 66, earlier went to the Union Election Commission office to register her National League for Democracy (NLD) party, which must now wait at least a week to be officially endorsed. “They have signed for their party registration already,” a commission official told AFP, referring to Suu Kyi and other senior party members.